In this module we will not be re-designing the system but rather tuning it to increase the dynamic range. Thus we'll have to look carefully inside the "black box" depictions of the devices and in this way become "device experts" rather than "system experts"--though a clear understanding of the system we're working with is obviously needed. To look in the black box that senses light, we'll have to learn more about the two component signaling cascades that the device is built from. As was mentioned last time, the bacterial photography system exploits a common signaling pathway in prokaryotic organisms, namely the "two component signaling" (2CS) pathway. As you learned, the two components are the sensor and the responder molecules and they are sensitive to changing environmental conditions. Hundreds of signaling pairs have been identified, and though variations are plenty, there is a common theme to the signaling mechanism the two components use. In general the communication of the 2CS pair is via a three reaction "phosphorelay." Stimulation of the sensor by a ligand (or a change in the environment or a detectable cellular input) leads to a change of state for the sensor, e.g. it may dimerize, change conformation, etc. 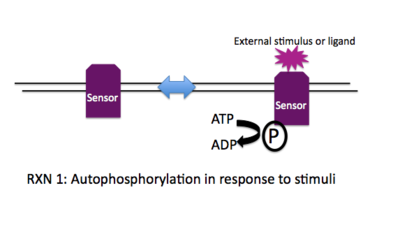 This altered state stimulates the autophosphorylation activity of the sensor and the gamma-phosphate from ATP is transferred to a histidine on the cytoplasmic face of the sensor. Thus another name for the sensor molecule is "histidine protein kinase" and when a number of sensor molecules are compared, the histidine that is phosphorylated can be identified based on conserved sequence motifs that surround it. 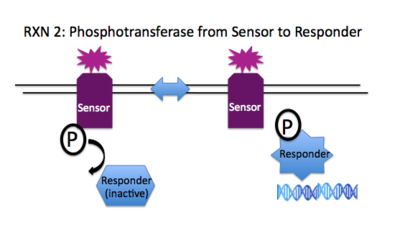 To transduce the signal from the sensor that's at the membrane to an effector molecule within the cell, the phosphate on the conserved histidine of the sensor is transferred to an aspartate molecule on the responder. 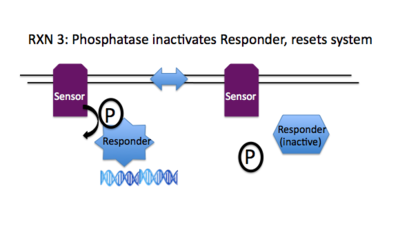 The phosphorylation state of the responder regulates its activity. In many cases, the phosphorylated aspartate enables the responder to bind the DNA and regulate relevant genes, provoking a sensible cellular response to the initial stimulus, e.g. swimming to the good food, transcribing pores to let in ions, etc. To reset the signaling system, the phosphorylation state of the regulator must be returned to its original set point. 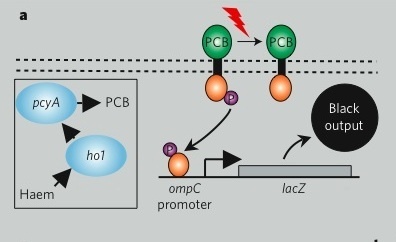 A phosphatase activity is associated with many of the sensor molecules in 2CS paths, enabling a single molecule to both enhance and diminish the signaling, consequently provoking and dampening the necessary response. Returning to the generic "black box" description of the system, we can fill in a few of the details, in a way that emphasizes the device details and aspects that might be manipulated to tune the existing system. You can decide for yourself if this is a helpful depiction of the system. Remember that you would like to have an image that emphasizes means of tuning the system. In our experiment, we'll be focusing on the OmpR signal carrier between the two devices. There are other ways to affect the input and output responses though and you should consider how helpful (or not) this abstraction is. If you like the depiction of the system shown here, know why. If you don't, come up with a better one! Today, we will assess the bacterial photography system as it was originally made. We'll measure enzymatic activity as well as view the resulting bacterial photograph. Next time we'll start to "tune" the system in order to expand the dynamic range of the system. You should perform assays on your overnight liquid cultures that were grown in the dark and the light. Refer back to the protocol from day 1. Activity calculations for today's samples will be part of your assignment for next time. Retrieve the Petri dishes you set up last time and compare the appearance of the light and dark grown samples. Because the dark grown cells were in a completely dark box, the difference between the two plates reveals the greatest contrast you can expect in your bacterial photographs. You should take a photograph (digital!) of these petri dishes since the result will be included in the final research article you write for this module. Next decide what image you would like to develop as a bacterial photograph. Generate a computer file with this image and print it to a transparency. Transparencies will be available in the lab for you to use as masks. As you choose an image, remember that the goal is to have each cell growing distinctly in the light or dark. Remember that light can bounce around edges and may blur the resulting image if the black and white are highly intermingled. In general, it’s better to have a dark background and a light image rather than the other way around. To darken the dark parts of your photo, you might want to print it on two transparencies and use them both to mask your Petri dish. Media containing S-gal is available for you to supplement with antibiotics and cells as you did last time. Once you've supplemented and poured a plate, let it solidify ~30 minutes at room temperature then tape the transparency to the back of the dish. Place your bacterial photograph in the 37° incubator (media side up) and when the class is ready, we'll turn on the red-lamp to expose the "coliroids" until next time. You will want to adjust the placement of the dish in the incubator once the light is on. The rule of thumb is the light image on the plate should be clearly visible but not super bright. If you can see the image clearly, and it doesn't look dim, you're probably in the right range. Over the course of the term, everyone taking 20.109 will be making two presentations to the class. One will be a presentation of a primary journal article related to either 2 component signaling systems or synthetic biology. The other presentation will be of a research idea. Today our wonderful coaches from the Writing Program will come to lab to give a talk about giving talks. This presentation should be a welcomed chance to learn what's expected when you speak (in 20.109 and elsewhere) and to gather some great tips for giving polished and interesting seminars. You can follow up this instruction by re-reading the oral presentation guidelines we've assembled for this subject. Calculate the units associated with the bacterial photography system grown in the light and the dark. Use this data and the photographs of your petri dishes grown in the light and the dark to draft Figure 1 of the research article you'll write for this module. Be sure this figure has all the traditional elements for figures (title, legend, labels etc). Consider again the depictions of the photography system that we've looked at (system level depictions, biology cartoon, device level operation). In particular, think about how you might use the image below to describe the experiment you'll be doing. Is there a better depiction for the system and the aspects of it that you'll be manipulating? If not, say why. If so, sketch it out and say how it's better. There's no "right" or "wrong" here but it's important to think about effective figures that summarize and anticipate your work. See Mod 2 Day 1. This page was last edited on 13 October 2009, at 15:18.